Thousands of Singaporean's are bidding a final farewell to the country's first ever Prime Minister Lee Kuan Yew as his funeral procession takes place in the city. Mr Lee, who died on Monday aged 91, co-founded the People's Action Party which has ruled Singapore since 1959, and was the island's first leader after it separated from Malaysia in 1965. 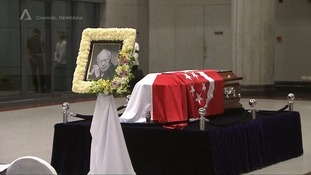 Mr Lee's coffin has been taken from parliament, where it had been lying in state, to be carried past significant landmarks including Singapore’s Old Parliament House, Marina Barrage, and St Andrew’s Cathedral on a gun carriage. More than 1.2 million Singaporeans have formally paid their respects to Mr Lee - nearly half a million queued to file past his body lying in state at parliament house, while more than 850,000 attended community tribute sites around the island. Several former and current world leaders, including Indian prime minister Narendra Modi, Japanese prime minister Shinzo Abe and Bill Clinton, will be among mourners at the funeral service at the National University of Singapore. A minute's silence will be held in Mr Lee's honour this afternoon. A private cremation will then take place at the Mandai crematorium. I am deeply saddened by the death of Lee Kuan Yew, Singapore's first prime minister. Mr Lee fashioned the Singapore and Asian region that we know today. Internationally, Lee Kuan Yew was a leading global statesman of his era, a co-founder of ASEAN and driver of Asia's rise. Singapore and the UK have a long and deep friendship. He will be sorely missed. David Cameron has paid tribute to Singapore's first ever Prime Minister Lee Kuan Yew after he died at the age of 91. Mr Cameron said Mr Lee "personally shaped" Singapore and made it "into one of the great success stories". PM: He personally shaped Singapore in a way that few people have any nation. He made his country into one of the great success stories. PM: That Singapore is today a prosperous, secure and successful country is a monument to his decades of remarkable public service. President Barack Obama has offered condolences on the death of Lee Kuan Yew, calling Singapore's first prime minister "a true giant of history." In a statement from the White House Mr Obama said that he appreciated Mr Lee's wisdom, including during discussions they held on the president's trip to Singapore in 2009 when Mr Obama was formulating his Asia-Pacific policy. Mr Obama said: "He was a true giant of history who will be remembered for generations to come as the father of modern Singapore and as one the great strategists of Asian affairs." Singapore is in mourning after the death of the country's founding prime minister at the age of 91. Singapore's first ever Prime Minister Lee Kuan Yew has died at the age of 91. The Prime Minister's office confirmed the country's former leader had died in a statement which read: "Mr Lee passed away peacefully at the Singapore General Hospital today at 3.18 am." Lee co-founded the People's Action Party, which has ruled Singapore since 1959, and was the island's first leader after it separated from Malaysia in 1965.